This summer Bury St Edmunds has been home to 26 wolves. Thousands of people have scoured the streets looking for the wolves. The wolf trail is the initiative of the Business Improvement District (BID) Ourburystedmunds with the help of other partners. A set of 5 postcards of the wolves on the Bury St Edmunds Wolf trail is now available from the Cathedral Shop, Cathedral Tourist Information Point and Moyses’ Hall Museum. 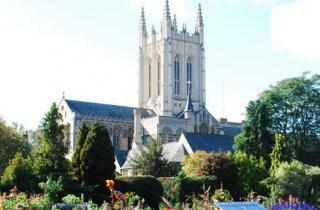 Visitor numbers have increased significantly at both St Edmundsbury Cathedral and Moyses’ Hall Museum as a result of the trail. The wolf in the Cathedral, which can be found near the High Altar, is made by West Suffolk College student, Rosie Brown. Moyses’ Hall Museum has a fine stained glass panel depicting a wolf, created by John Messum. Both of these wolves can now be found on postcards too. The trail will be in place until 20 November, St Edmund’s Day.